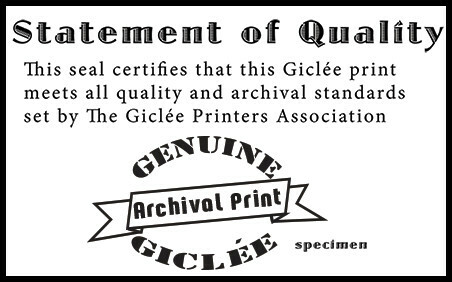 Why should I reproduce my artwork as giclées? Print-on-demand has forever changed how fine art print reproductions are created and marketed. Avoid the costs associated with producing a large inventory. You don't have to pre-purchase inventory prints until you have orders. Of course, it's always recommended to have actual samples of each image, various sizes offered, media choices, etc. to show clients in person. Creates multiple sales from your originals that faithfully represent your work to increase your collector base. Offer a range of sizes, price and media choices to your collectors that are easily and affordably fulfilled. Why choose Digital Arts Studio? Nationally recognized in magazines: Art World News, Digital Graphics, Digital Output, Picture Framing, and Photo Marketing Association trade journals. One of a select few to become a Certified Studio by Hahnemuhle FineArt, producing mould-made cotton rag art papers since 1564. Dedicated and knowledgeable professionals to advise and guide you towards success. On-site digital capture of your original art - 200+ Megapixels! One flat fee includes scan, proofing, and back up files. Over a dozen fine art/ photographic paper and canvas options; posters, specialty media, mural, etc. Twelve color, all archival, pigmented inks, prints as large as 60 inches wid and 120 inches in length. A "one stop shop" providing print and framing services, order fulfillment, marketing materials and assistance. Fast turnaround, all work guaranteed. Our typical turnaround for "print only" orders is 3-4 days. Stretched canvas usually takes 4-5 days. Special projects, processes, etc. may add additional time. Seasonal and/or large orders may also impact our turnaround. You may always contact us to discuss your needs and deadlines. We will always do our best to accomodate the needs of our clients. 48 hr. RUSH SERVICE for prints may be requested for an additional charge. PLEASE CALL US TO PRE-SCHEDULE! [ zhee-KLAY] n. 1. An archival, fine-art print created via digital inkjet printing utilizing museum-quality papers and canvas as well as using pigmented inks. AKA: Archival Pigment Print 2. Most often associated with reproductions; a giclée is a copy of an original work of art that was originally created by conventional means (painting, drawing, etc.) However, photographic or computer-generated imagery printed using this method can be considered original since they are not reproductions at all but rather museum-quality prints created from a digital image file. You may order only one 8x10 print at a time if you wish. Quantity discounts begin at five or more of the same image and size. We have a volume program for resellers; please call for details. Our studio is open to the public Mon-Fri 9:00 AM to 6:00 PM and Saturday 10 AM to 5 PM EST. No appointment is necessary to place an order in person or to review samples, etc. Live ONLINE CHAT is available during normal business hours. You are welcome to send us questions by email or leave a message. We will reply as soon as possible. We prefer JPEG or TIFF images. Maximum file size for online store upload is 100MB. PDF files may also be submitted. Vector files (.AI, .EPS) must first be converted to one of these formats before uploading. Preferred color space is Adobe RBG 1998. CMYK and sRGB will be converted snd may cause some color shifts. We prefer most images to be 300 dpi (ppi) at the desired size but large images will print very well at 150 dpi. Send us the highest resolution file you have. If not sufficient, we can often "up-rez" images for acceptable results. We can send a "detail proof" (section of image at desired image size) for $7.50 so you may evaluate. Editing charges may apply. We offer a 100% quality satisfaction guarantee*. If you are not completely satisfied, we will gladly exchange, reprint, or issue a full refund, provided the issue is reported to us within 10 days of delivery. Please notify us at info@digitalartsstudio.net and someone will contact you to discuss the issue. *We CANNOT guarantee 100% color accuracy on prints made from your submitted files. There will always be slight differences between viewing images on a monitor (transmissive) versus viewing an actual print (reflective). We employ a calibrated and color managed workflow from start to finish . If you are familiar with and using industry standard color management in programs like Adobe LightRoom or Photoshop, you can expect a reasonable amount of accuracy in what we print for you. If you are not using color management, there my be inconsistencies and therefore always recommend requesting a “proof” print to evaluate and adjust if necessary. (8.5x11 on your choice of media). A hard copy is the best way to see how your colors will print. Generic profiles for soft proofing are also downloadable from the online store. Proper knowledge and use of ICC profiles in PhotoShop or LightRoom can provide a more accurate visual as to how your files will print. If you do not have monitor calibration hardware, you may also download a screen accuracy test file to evaluate your monitors color rendition. If match prints are provided, we will color correct in-house for $23.75 per image and make every effort to match or come as close as possible. Due to variations in paper types, ink sets and equipment, some color variations may still occur. We carefully calibrate, test and evaluate all the materials we use; papers, canvas, varnish, matboard, etc. You may notice that we indicate specific brand names in our descriptions so you are assured consistent results when placing future reorders. Breathing Color Chromata LYVE canvas is the best on the market and made in the USA. Hahnemuhle, Canson, Arches, and Somerset are all "old world" fine art paper mills that have produced archival, cotton rag fiber papers for centuries. Museo Silver Rag has consistently taken top awards in photo print quality competitions. Canon Lucia EX pigmented inks have the largest gamut (color range) of reproducable color. Archival prints on fine art papers or canvas will last for many decades with proper care. All coupon and group codes must be entered in the shopping cart prior to checkout to be applied. If you are a member of an eligible group, contact that administrator for your specific code. (KelbyOne, Atlanta Photography Group, Roswell Photographic Society, Southeastern Photographic Society, Women In Focus, Atlanta Artists Center, Georgia Watercolor Society, Georgia Nature Photographers Association). No coupon codes will be honored after purchase has been made.